The mixed mushrooms I used here included mainly easy-to-find grocery store mushrooms. I used cremini (often sold as “baby bellas”), a few leftover white button mushrooms, some shitakes, and some king oyster mushrooms, my newest favorite. You can use whatever is available to you that you like, but if you see the king oysters, try them. They have a great texture for stir fry and sauteing. Check out this list of mushrooms and maybe try a new one in this recipe. I also used my personal perennial favorite ingredient for all things: potatoes. They are grown underground, so they are definitely “earthy” too, right? 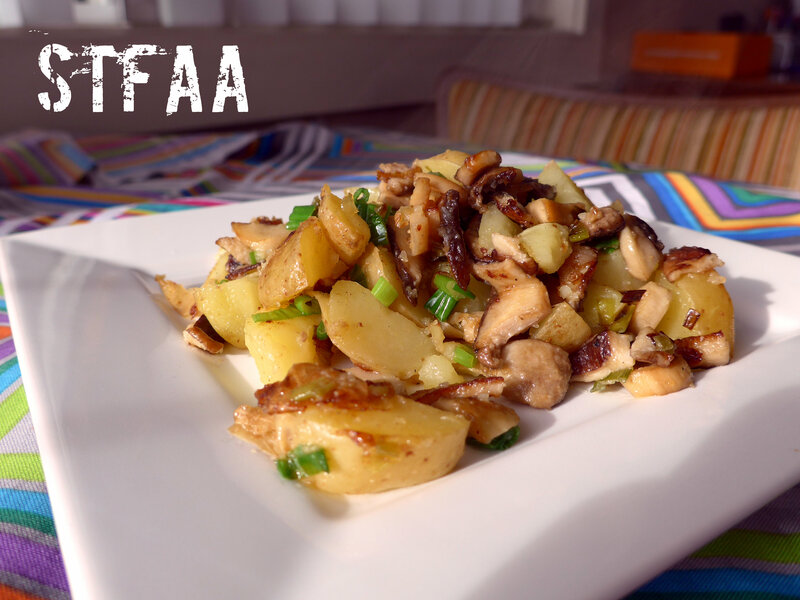 If you can get them, yukon gold potatoes are my favorite for hash because of their texture. Any waxy potato (yellow or red) will work, but the textures will vary subtly. In this hash, I’ve parboiled the potatoes before frying them. I used a trick I learned in the Farm to Table Asian Secrets cookbook: adding vinegar to the boiling water helps the cooked potatoes hold together when you cut them after boiling. For this recipe, you’ll need a pot to boil the potatoes in and a skillet. You should have plenty of time to clean and chop your mushrooms while the potatoes cook, and then time to chop the cooked potatoes while the mushrooms cook. I’ve done the hash over medium heat because I don’t want to burn things, but if you’re brave, a higher heat will give you more sear on the vegetables, more like a professional kitchen and better taste. Let me know if you do it that way. For me, this is ultimate comfort food. First, potatoes are my go-to comfort food, but crisping them in oil and mixed with mushrooms, I also feel fancy and indulgent. 2 Tablespoon vinegar any kind works -- don't use anything expensive here! Wash potatoes and put in large sauce pan with water, vinegar, and salt. Bring to a boil and then turn down to a low boil. Cook potatoes until tender (can you stab a knife into them? Then they are done.) This will vary depending on the size of your potatoes, but texture-wise, boiling them whole is the right call. Wash and dry mushrooms. How you do this depends on the mushroom, but with most of them I just run them under water and rub the visible dirt off with my fingers and then path them dry with a towel or paper towel. Chanterelles, I soak and swirl for a few minutes. Chop mushrooms or break into bite-sized pieces. Chop scallions and separate the whites from the greens. Light green goes with white. You will cook the whites and use the greens as garnish. Add 1T of oil to your skillet over medium heat. Add the garlic powder to it and the onion whites, stirring well. When it is shimmery, add the mushrooms and stir well to coat with the oil. If you need to, add a bit more oil to fully coat the mushrooms, but stir them well first. Cook mushrooms, stirring frequently but not constantly, for up to 10 minutes. They will start to brown and smell very earthy -- that's what you're looking for. While they cook, drain and cool the potatoes enough to touch. I lay them out on the cutting board to cool. Chop them into hash-sized pieces. Think dice. Push the mushrooms aside and dump the potatoes into the center of the pan. Add about 2 teaspoons of oil, and stir just the potatoes until the oil is coating them. Spread them out, mostly piling the mushrooms on top. Let them sit and cook for about 5 minutes, and then stir and cook for a bit more -- as much time as you can give them to crisp up and meld with the mushrooms. Just before taking the hash off the heat, stir in the scallion greens and taste. Add salt and pepper if needed. Serve hot. Next Post:Chocolate Pudding with Whipped Topping, both Vegan and Gluten-Free!